Wrath of the Lich King expansion required. The [Bag of Fishing Treasures] that drops this pet can be obtained by completing any of the Northrend daily fishing quests. The fishing skill required for each of these quests varies from as low as 1 to as high as 475. The level requirement for these quests is level 70. The [Bag of Shiny Things] can be obtained by completing any of the Stormwind or Orgrimmar daily fishing quests. The level requirement for these quests is level 10. The fishing bags that drop this pet can also be purchased with Timewarped Badges during the Cataclysm and Wrath of the Lich King Timewalking in-game events. Snaps at the enemy, dealing 394 Beast damage. Mine is an HH also. I use him offen in Pandera. Very hard to kill. The pet that would not die! By far my favorite pet when I was leveling, before I really understood the Pet Battle system. I could always count on this guy to stay alive in almost any fight. Turns out mine was an H/H, which explains why he was so tough. The defensive buff and his HoT ability are a winning combo. Prior patch 5.3 it used to drop as long as you had 2 or less Strand Crawler's in your pet journal. After 5.3, if you have at least 1 in your journal it no longer drops. I have done around 600 fishing daily quest on all my characters during 30 days, while having 1 Strand Crawler in my journal. If you want to collect more than 1, be sure to put in cage all your Strand Crawlers, before opening the bag. I dont know how I got it. Maybe it was an add,and I captured it,because it was rare. When I started using it, I couldn't believe how good it it was. It easily put sinister squashling to shame in both damage, and healing. At level 18, I soloed 3 level 24s! The Shell shield ignores stampede, swarm, nuts, eggs, and DOT effects, allowing you to have turns where you dont take any damage, deal damage, and heal all in one! This pet is my #1 pet so far. Great for leveling other pets when it hits 25. Combination of the sheild (c-ya later dots!) and healing is great for not having to bandages or revive after battles. 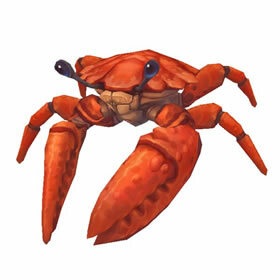 I highly recommend finding a rare Shore Crab, Strand Crab, or Strand Crawler to help with leveling other pets. I has even become an all star in pvp pet battles. This crab's survivability wowed me from the beginning. I have used it as one of my core pets since I started doing battle pets; indeed, since battle pets came into existence, really. Those who have one of these will rejoice; those who have to *face* one of these will probably feel rather crabby afterwards. I was battling a frog In ashenvale near the falfarren river and it came up as an assisted wild attacker. Sadly I didn't know how rare it was until I captured the frog so I couldn't capture it also. By far my favorite pet! This pet surprised me with its survivability. Even though it isn't the cutest, it definitely packs a punch. With its shield and heal it can easily survive a 3 pet fight with barely a scratch. Definitely worth leveling up! Only took me 16 attempts, I nearly fell out of my chair when I got it today! So adorable! Over the last month I have lvled a Goblin Shaman to 85, sometimes doing fishing dailies from Org/UC/TB, Shattrath AND Dal all in one day. I still have never gotten this pet! On the priest I lvled, I got it almost right away. I don't much believe that 1/200 or 1/100 is correct. It's basically whether the game likes you that day. And apparently it hasn't liked me in a while! With 1/200 drop rate from dalaran dailies and 1/100 from orgrimmar dailies i dont see how 70% of users here have it. I m doing both dailies for 2 months now every day and still no luck. RNG i guess. My NE Rogue got this doing her first dwarven fishing daily in Iron Forge. It's the first time I got a companion pet on any of my toons doing fishing dailies. This and a liquor recipe. It was a fishing boon day. just clerifying, this drops from the dailies in SW from catherine leland? Awesome pet, I just got it today. I only had to do the Stormwind fishing dailies enough times to get the achievement, and then I got the pet too! :D Double the happy! Oddly enough though, I don't have the Lich King expansion?? Only Burning Crusade. Sooo... lucky me. Just got this pet from the Thunder Bluff fishing daily! Edit: Also noticed when I equip my fishing pole it summons him! i've been doing the stormwind fishing daily just about every day since cata... with no luck. for about 2 weeks now, i've been doing the daily dalaran fishing quests and FINALLY today i got the strand crawler from dalaran! yay! The strand crawler has adapted to the northern cold by hibernating under the island beaches.